1,200 Dead Oregon Cows Not Killed By Wolves! Where’s The Media? Ok, 51,200 cows died in Oregon in 2010 from non-predation causes. This should be front page news, right? When wolves are involved in miniscule livestock losses they make the front pages of local media. So what about those 51,200 cows that WERE NOT killed by wolves? ODFW (Oregon Department of Fish and Wildlife) is planning on killing the alpha male (pictured left) and another wolf from the Imnaha Pack, for tiny livestock losses. Yet huge numbers of cows drop dead in Oregon every year and all we hear is “crickets”. So here we are, two wolves facing a death sentence. Apparently they are being tracked right now. The alpha female and her pup of the year will be left to face the winter alone, with no help to bring down prey. In protest of ODFW’s egregious intention to slaughter two perfectly healthy Imnaha wolves, leaving just the alpha female and her pup of the year, two Portland Animal Defense League protesters, Stephanie Taylor and Justin Kay, chained themselves to the ODFW headquarter doors with bike locks. For nearly an hour and a half Tuesday morning, protestors took over the front entrance of the Department of Fish and Wildlife in Salem. “We’ve tried everything from phone calls to the governor, phone calls here, letter writing, protests. Finally today, it ended with an act of civil disobedience,” said Tim Hitchins, with the Portland Animal Defense League. The sad news is this is probably the end of the Imnaha Pack. Oregon had 1,300,000 cattle at the beginning of 2011. 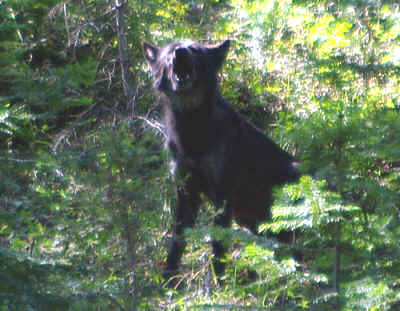 Wolves apparently were responsible for 14 cow losses in 1.5 years. But thousands and thousands of cows were keeling over in Oregon from all manner of things, not wolf related. Why aren’t ranchers squawking about this? Those losses COULD affect their “bottom line”, not 14 supposed wolf depredations. Isn’t it time to call this situation what it is. If if looks like a duck, quacks like a duck then it’s a duck. Plain and simple intolerance of wolves is ruling the day in eastern Oregon. Apparently ranchers don’t want them there and that’s what’s driving this train. The wishes of Oregon’s wildlife advocates and others, who would enjoy seeing wild wolves, apparently don’t count. The scapegoating and hysteria that plague the other wolf states has apparently taken hold in Oregon. Shame. This has completely altered my view of the state. 51,200 dead cows not killed by wolves. Where’s the media? ?